Engineered Pool Supplies are one of the UK's leading suppliers of Environmental Control Schemes to indoor pools and leisure complexes. Our expertise is beyond question and is relied upon by seasoned pool contractors, local authorites, major building contractors and Professionals such as Building Services Consultants and Architects. We will assist your project to develop into an effective leisure facility from initial planning through to completion and instruction. Do not think that Environmental Control is the only area that EPS can assist you. Using our AutoCAD facilities our experienced designers will plan the pool shell and filtrations systems together with the pool interfaces with the structure and foundations, particularly important with indoor basement pools. Many indoor and outdoor pools have been built by customers / building contractors, using our design expertise and our engineers to install the filtration system whilst the pool shell and tiled finishes were provided by others. To continue to develop energy efficient heating systems, utilising heat recovery, and renewable energy sources such as ground and air source heat pumps and dual fuel systems. To continue to provide reliable advice, accurate designs, and effective energy efficient swimming pool environmental control schemes. To provide the essential building protection whilst maintaining comfortable conditions for spectators and swimmers. To build upon our already impressive reputation in the industry for our core services, and to continue to develop additional services and products for the industry. EPS was established in 1993, by a consulting company specialising in design and trouble shooting of indoor pool systems. Since that time over 800 schemes have benefited from our experience. EPS's founder, John Scott, formed the company after a technical management position at Calorex Heat Pumps, the industry's most respected and prolific manufacturer of heat pumps and dehumidifiers. John was previously a Consultant Engineer designing and specifying complex Building Services systems for the oil and gas industry. EPS provide their schemes for many of the major Pool and Construction companies as well as local authorities, hotels, leisure centres, schools and home-owners. Most of our work is repeat business. We like to think this is a fair indication of customer satisfaction. EPS's founder and managing director is a fellow of the Institute of Swimming Pool Engineers, (I.S.P.E. ), and also sits on the Institutes governing council. EPS regularly provide technical seminars and training sessions for the new and experienced engineers throughout the trade. 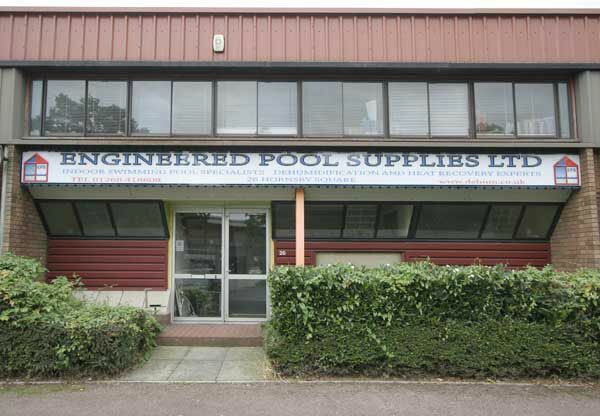 In October 2007 EPS's founder John Scott became President of the Institute of Swimming Pool Engineers, the industry's foremost training and education body..
As part of ongoing development and growth to promote a better service, EPS relocated from Romford to larger premises in Basildon in April 2004. The move allowed improved spares holding, fabrication, training and the R&D associated with being one of the pool industry's engineering experts. For more information, to send drawings, or for an informal discussion regarding any forthcoming projects, please use any of the contact methods list below. If you wish to send AutoCAD format drawings please purge and Zip compress them before emailing. Please note that to reduce spam problems the above email addresses have additional spaces added. These will need to be removed when you send an email. Send mail to sales @dehum.co.uk with questions or comments about this web site.